TSSM reserves the right to alter or revoke the advertised program details. Confirmation of Enrolment and Tax Invoice including Maps will be issued 5 days prior to the commencement of each program and sent by email. TSSM will not accept any responsibility for loss of mail (email). Students who have not received their Confirmation of Enrolment and Tax Invoice by 5 days prior to the commencement of each course must contact our head office to confirm their enrolment and arrange admission. The Confirmation of Enrolment and Tax Invoice for each student is sent via email on the exact same date for each course no matter how early a student/attendee enrols. The exact date of when the Confirmation of Enrolment and Tax Invoice is sent via email for each specific program can be found on the course's/program's application brochure, downloadable from this website. To ensure that all visitors to our centre are both safe and comfortable, students/attendees participating in programs at TSSM must adhere to the following 'Student Conduct Policy'. Consuming food and drink (except water) is prohibited on this level. Smoking in this building is strictly prohibited, (including the stair wells and toilets). Students are to conduct themselves appropriately in all common areas of the building. Students must at all times be aware of their noise level in all common areas and endeavour to keep their noise level to a minimum. Students must display excellent manners and respect to all other tenants in the building. Students must be mindful not to congest foyers, lifts and common areas within the building. Students will maintain the lifts, foyers and common areas in a clean state and will dispose of their rubbish appropriately. Students agree to keep the toilets in a CLEAN & HYGIENIC state at all times. The use of any recording and/or photographic devices is STRICTLY PROHIBITED. Conduct of any sort other than for educational purposes is not permitted on this level. No refunds will be issued for cancellations made after the closing date for application cancellations. 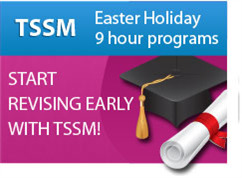 The closing date for application cancellations can be found on the specific course's application brochure, downloaded on this website or by requesting it from TSSM on 1300 134 518 from Monday to Friday between 9am and 5pm. Refunds for cancellations made prior to the closing date for application cancellations will incur an $11 service charge for all courses except for our Intensive Weekly Tutorial Classes which will incur a service charge of 10% of the course payment. No refunds will be issued for cancellations for students who are allocated their first, second, third, fourth, fifth, sixth, seventh, eighth, ninth or tenth preference for a particular subject; students should only select the preferences that they are able to attend. No refunds will be issued for the Initial Deposit paid under the Periodic Plan Investment option for any cancellations for our Intensive Weekly Tutorial Classes. Refunds will not be issued under our guarantee if the student/attendee has not attended the entire program, nor for a subject that has not been paid for when using the '3 subjects for the price of 2' offer. All refund requests under the guarantee will be thoroughly investigated as TSSM values the quality of its programs, and TSSM will determine whether a refund request under the guarantee will be processed, this will be done in good will and without bias. All refund requests to be investigated under the guarantee must be submitted in writing by the closing date. The closing date for refund requests under our guarantee can be found on the specific course's application brochure, downloaded on this website or by requesting it from TSSM on 1300 134 518 from Monday to Friday between 9am and 5pm. All refund requests under the guarantee will be thoroughly investigated as TSSM values the quality of its programs, and TSSM will determine whether a refund request under the guarantee will be processed, this will be done in good will and without bias. All refund requests to be investigated under the guarantee must be submitted in writing by the closing date. The closing date for refund requests under the guarantee can be found on the specific course's application brochure, downloaded on this website or by requesting it from TSSM on 1300 134 518 from Monday to Friday between 9am and 5pm. Any refund request under the guarantee made after this date will not be eligible for a refund or credit. For our Semester 1 Intensive Weekly Tutorial Classes; Refunds will not be issued under our guarantee if the student/attendee has not attended the first two weeks of the program. No refunds will be issued under our guarantee unless we are notified of the request in writing by 5pm Monday March 18, 2019. For our Semester 2 Intensive Weekly Tutorial Classes; Refunds will not be issued under our guarantee if the student/attendee has not attended the first week of the program. No refunds will be issued under our guarantee for our Semester 2 Intensive Weekly Tutorial Classes unless we are notified of the request in writing by 5pm Monday August 13, 2018. Enrolments using the “3 subjects for the price of 2” offer cannot be shared amongst students/attendees, it is valid per person only; it cannot be shared across the different programs, for example the September Holiday Program and the End-of-Year Revision Program. The offer '3 subjects for the price of 2' only includes subjects e.g Maths Methods, Chemistry. The offer is not valid for courses such as our Additional Application and Extension Program and our UCAT Mastery Sessions. It must be used on a per program basis only; and applicants must pay for the two higher valued subjects. Schools will be invoiced for payment upon receipt of their online orders. Refunds are not available for resources being purchased. Resources include Student Trial Examination Papers, School Trial Examination Papers, School Targeted Evaluation Tasks for School-assessed Coursework, School Key Topic Tests, English Study Maps, English Text Summary Notes and English Context Summary Notes. Ensure that no double orders have been made for any of these recourses. Resources are not automatically downloadable when ordered online, unless you have 'VIP Membership' with TSSM and the resource has been released and is available in electronic format. Otherwise, they need to be manually processed by TSSM prior to delivery. TSSM reserves the right to ask for extra information from the person making the order via email, telephone or post in order to establish if they are permitted to order the resource. There are some resources that are exclusive to schools (student cannot order them) and other resources that are exclusive to students (schools or teachers cannot order them). TSSM reserves the right to hold off the delivery of the resources order if the extra information asked for is not received. Shipping for these resources is 5 working days from the date we receive the order, provided that all required extra information has been received by TSSM. Student Trial Examination Papers, School Trial Examination Papers, School Targeted Evaluation Tasks for School-assessed Coursework, School Key Topic Tests, English Text Summary Notes and English Context Summary Notes can be ordered as hard or electronic copies. Electronic copies are delivered by email in pdf format only. Study Maps and Exam Practice Guides cannot be shipped as electronic copies, they can only be shipped as hard copies. Zero for regular electronic delivery via email (if the resource is available to be delivered via email). Quantity of 1 - 3 VCE Resources - $13.95 per order. Quantity of 4 - 10 VCE Resources - $16.95 per order. 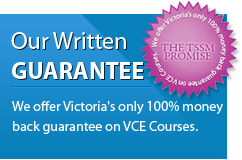 Quantity of over 10 VCE Resources - $19.95 per order. Express Electronic Email Delivery - $3.30 (if the resource is available to be delivered via email). Quantity of 1 - 3 VCE Resources - $16.95 per order. Quantity of 4 - 10 VCE Resources - $19.95 per order. Quantity of over 10 VCE Resources - $22.95 per order. All prices quoted on this website are in Australian Dollars and are inclusive of GST. Unpleasant, discriminatory, attacking, abusive or use foul language. Disclosure of any persons personal information. In violation of any law, regulation, or third party's rights. 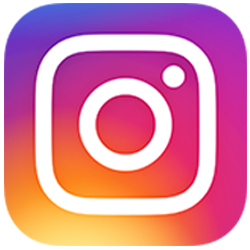 If you spot an inappropriate post that you believe to breach the above terms please send us a private message or an email to info@tssm.com.au in order for TSSM to review your concern.